That's right, this is a homemade vegan white fungus cheese! It's super creamy, with an overwhelming brie flavor and a firm rind. I've been coveting the moldy nut cheeses on various German and English blogs, but a lack of affordable vegan starter cultures was holding me back. I bought cashew camembert by Happy Cheeze a few times, and I started wondering if it would be possible to use a piece of moldy rind from a store-bought cheese as the starter for a homemade one. I like experimenting, so when I had another Happy Cheeze camembert, I cut of a small piece of rind and blended it into my cashew cheese mixture. A few days later, some beautiful white mold started to appear. Success! I don't know how many times this little trick could be repeated before the fungus gives up. If you make your own yogurt, the starter culture can go on pretty much forever, as long as you keep it clean and pure. I couldn't find out whether cheese fungus works the same way. Even if it only works once or twice, it's a nice way to save a bit of money. If do you have a freshly bought starter culture, you can also use that in this recipe. My recipe is based on those by Full of Plants and Lecker Planzen. Their cheeses are made almost entirely from cashews. I wanted to have creamier cheese similar to ripe brie, so my recipe has more water and coconut oil. The coconut oil also helps the cheese set once it's placed in the fridge, making it easier to handle. An added advantage of a higher moisture and fat content is that the cheese melts easier. This makes it very suitable for use on pizzas and casseroles. Add it in the last five minutes of baking so it melts, but does not evaporate too much. In the picture you see it melted on a pizza with tomato sauce, artichokes, thinly sliced onion and red peppers. This particular pizza is not low carb (sorry! 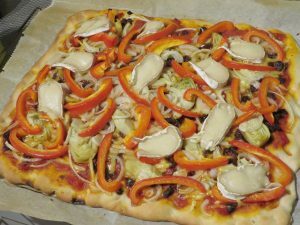 ), but the brie would also be very good on my low carb pizza recipe. It has quite a strong flavor, so you only need a few thin slices. Many people are a bit afraid to make fermented foods at home, let alone grow a fungus in their fridge! However it's really quite safe, if you just work clean and make sure no other fungi than the white fungus grow on your cheese. You does not need a lot of special equipment for this recipe, just a strong blender or food processor and a fridge. You will need some patience, but it is 100% worth it. UPDATE: I removed the fermentation at room temperature, because I think the cheese tastes better without it. Drain the soaked cashews and add them to the jar of your blender or food processor along with the water, coconut oil, yogurt, camembert rind (or penicillium candidum) and salt. Blend into a smooth mass. Depending on the strength of your machine, this could take a few minutes. Add one or two tablespoons more water if needed to help the blending. Take a flat bottomed round bowl that can serve as a cheese mold and cover it with plastic wrap. Pour the cheese mixture into the mold. Cover and put the cheese into the fridge for 8 to 16 hours so it can firm up. Once the cheese is set, carefully peel away the plastic wrap and place the cheese onto a piece of parchment paper, in a sealed plastic container that is large enough so the cheese has a little space to breathe. Make sure to touch it as little as possible with your bare hands, so you do not contaminate it with the wrong molds or bacteria, especially in the beginning. Place the container in a room where the temperature is between 11 and 15 degrees C / 50-60 F. If you do not have such a room, the least cold spot in your fridge will do if you don't set it super cold (often the top shelf is warmest). The cheese now needs to ripen for about 3 weeks at this temperature. Turn it over every day with the aid of a piece of parchment paper. If there is condensation on the sides of the container, wipe it off with a paper towel. Replace the parchment paper when it gets wet. The sealed container helps to keep humidity high, but it should not get wet inside. The cheese's odor can change from day to day, from fruity to sour or even a bit yeast like. This is all fine. After five to six days the fungus will start to grow (see the pictures). It can have a grayish white or yellowish color. The cheese will continue to firm up. At some point you will be able to place it on a sushi mat or similar item instead of the parchment paper to allow more air to reach its bottom. Keep turning the cheese regularly so it do not stick to the mat. If the fungus on one side of the cheese grows faster than that on the other side, you can leave the slow growing side facing up for a few days so it gets more air. However, keep lifting the bottom off the mat every day, to prevent sticking. After about three weeks your cheese will finally be covered with a nice thick layer of white fungus. You can now eat it, or keep it in the fridge a while longer. The fungus will continue to grow. If you want to make more cheese after this one, cut off a nice clean piece of fresh rind and start all over again with the recipe. Trying any recipe from this site is done at your own risk, but that's especially true for experimental stuff like this. Study the instructions and maybe read up on fermentation a bit more before you begin. Some people (including myself) get a bit of an itchy feeling in the back of their throat when eating fungus cheese. This is a mild allergic reaction, just like some people get from eating certain fruits like kiwi, pineapple and apples. Do not eat the cheese if you react badly. It may help to only eat the creamy part of the cheese (which has the most flavor anyway) and not the rind. The reaction is also much milder after you heat the cheese up, like you would do for a pizza, panini or casserole. Since this is a very tasty way to eat the cheese, it could be a good solution if you find you get a scratchy throat. Hi Harald, thank you for commenting! I was very happy to have your recipe as inspiration for my own attempt. Interesting that you use psyllium husk now. Maybe I'll play around with that a bit too. Hi there... any tips on where to find either the vegan cheese or the penicillin in Belgium?? Neighbouring countries, but I feel like Netherlands and Germany have gone farther with readily available vegan products. Well, Belgium is definitely getting much better compared to 7 years ago! Hi NT, I don't know a Belgian (or Dutch) shop that sells vegan cheese cultures. That's why I just used the fungus I got from a store bought vegan cheese. You can order the cultures from Cashewbert, they ship internationally for reasonable prices. "... compared to 7 years ago!" .... now just imagine 25 years or from back in the 70s when vegetarian food was the worst! Grass and twigs. Anyway, great recipe, nice addition of the coconut oil. Vegans have conquered breakfast and dinner, milk, juice, Thanksgiving dinner. It is on the cusp of completely conquering cheese. I know Chef Sky is trying to perfect lunchmeat, but why? 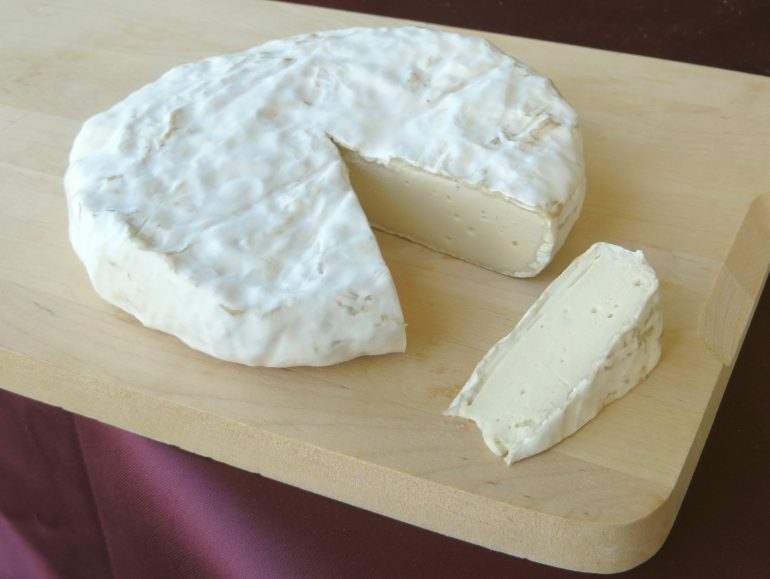 Hi Kristi, as I describe in the introduction, I used a piece of rind from a Happy Cheeze camembert as my starter. The instructions for liquid candidum drops were inspired by other blogs that have tried this. You can also use a powdered culture if that is what you can find. Check out the Cashewbert website for vegan cheese cultures. I can not have coconut, is it any way to replace it? Hi Malgorzata, any oil or fat that has a neutral taste and is solid at room temperature should work for this cheese. You could for instance try shortening, refined palm oil, refined food grade shea butter or refined cocoa butter if you can find it. Fabulous results! Especially as it seems a shorter time than some of the other recipes which is hugely exciting! One question, you don't mention salting the cheeses which Full of Plants does. Did you have a reason for not doing so?? Thank you. Hi MC, I'm happy that you are excited about my recipe! I prefer to add salt to the cheese mixture itself rather than salt the outside, because I feel it is easier to control the saltiness of the cheese that way. It works just as well! Hi Marie, I think rind from a dairy cheese will probably work. I think pasteurization happens to the milk before they add the mold, so you should have live mold, even on a pasteurized cheese. Hi Niels, I think grey mold is probably okay. The white mold can be yellowish or greyish in hue, especially during ripening. Just watch out that you do not get blue or black mold. In the end it should have a nicely unicolor white fluffy coat. Hmmm. it is a fairly dark shade of grey, clearly distinguishable from the white mold. I have two cheeses, and one of them has it more than the other. I'm worried it's the black mold you are talking about :( or is that really pitch back ? Hey Martine, thanks for your answers. It's too much to take off. I am still in doubt though.. Let me put it this way: is it in any way possible that the good mold grows in two different colors at once? I don't think so. I've never had darkish grey on my cheeses, only slight variations of white. You could let it grow for a few days to see how it develops, and then decide whether you want to eat it. Better safe than sorry though, the wrong mold can really make you ill in a bad way. Hi Quentin, coconut oil should always be solid below 22 degrees C and liquid above that temperature. If yours was liquid below 22 degrees, it is probably not pure coconut oil, but a mixture of coconut and other oils. For this recipe you need the pure coconut oil that is solid in the fridge. The cheese is always a little soft just after you make it, but it should not be liquid. It will firm up further as it ages. Until then, use foil or parchment paper to handle it. Hi there, this is very interesting and I wouls love tomale this vegan cheese myself. However, all the Pinicillium I find on the internet contains dairy... is there a vegan version of it? Hi Gustavo, there are several suppliers who have dairy free cultures. I order mine from Cashewbert. If you have trouble finding one that delivers to your country, ask around on the Vegan Cheeze hits and misses group on Facebook. People can hopefully direct you to a local company. It was all going so well then day one of turning it all cracked and split. I’m not sure we’ll get through the week without the whole thing falling my apart. It is very big though so I was going to try again as I’ve now got all the ingredients and make two smaller ones. The problem might be the bowl I set it in wasn’t a flat enough bottom and when I turned it over the curve broke it. If you know what I mean. Anyway attempt no. 2 will shortly commence!!! Wish me luck. Hi Sharon, sorry your cheese broke! If its just two large pieces you could continue fermenting it just like that. If its really falling apart, I'd try forming the scraps into two smaller wheels and fermenting it that way. You can use plastic wrap and a bowl to reshape the cheese mass. Good luck! Hi Martine, I've made this recipe twice now, once with vegan yogurt and the second time using MM100 culture in its place. Both time I end up with something that looks good but as a seriously soapy aftertaste. So much so that it's not edible. I've done a bit of research and it seems to be due to lipase production from the coconut oil. Have you not experienced this flavor at all? I'm going to try a version with no coconut oil to see whether that's the issue. Hi John, the soapy flavor can happen if the cheese is ripened at too low temperatures. You can try turning up the temperature of your fridge a little and/or place the cheese on the top shelf, which is usually less cold than the bottom. Another option is to use less coconut oil, but that will result in a firmer, less creamy texture. Hi Martine, Thank you for sharing this recipe. I have made an attempt and used penicillium from Cashewbert. I followed the instructions but the mixture didn't firm up in the fridge. I have been turning it over the last two days. But this is more scraping it off the parchment paper and transferring to another piece of parchment. Is this something you have come across. Do you think it will eventually firm up or have I done something wrong? Hi Linda, sorry you are having trouble with this recipe. You may have used a bit too much water. Did you use coconut oil? The coconut oil helps the cheese firm up. Eventually, the cheese will dry out a bit and become more firm, but if it is really wet that might take too long. You could reblend it and add a bit more coconut oil and cashews. Hello I was wondering the cheese shelf life after the 3 weeks of fermentation? Hi Apple, you can keep the cheese for another three weeks or so. What would the cheese be like without the fungus? Hi Ellen, it would be like cream cheese. You can make fermented cream cheese by letting the cashew-yoghurt mixture sit at room temperature for a day or two. Then you blend it a second time with the coconut oil and refrigerate so it firms up. Hello, I am new to making vegan cheese so please excuse my lack of knowledge. Can i use a piece of the rind from my first batch to make my next batch and how long can i store it and how do i store it ? Hi Vicki, you can do that, if your previous cheese was kept very clean. In my experience, store bought cultures get too contaminated after two or three generations. So you can use the rind from your first batch, but the chance of contamination increases for each batch, so you will probably not be able to do this indefinitely. Simply desire to say your article is as astounding. The clearness to your submit is just nice and i can assume you're a professional on this subject. Well with your permission let me to grab your RSS feed to stay updated with coming near near post. Thanks a million and please carry on the enjoyable work. Hi Martine. Thank you so much for your wonderful brie recipe. The end result was tasty beyond belief. The Brie is so delicious that I'll have to put a padlock on the fridge door and throw away the key. I can't stop having 'just one more 'teeny' piece. Hi Helen, that's lovely! Glad you enjoy it so much.